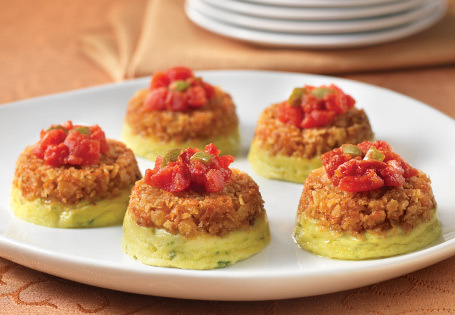 Coat a 24-count mini muffin pan with cooking spray. Combine the onions, corn chips, cheese and butter in a medium bowl. Press 1 1/2 teaspoons of the mixture in the bottom and sides of the muffin pan. Press down. Bake for 3 minutes. Cool completely. Lower oven temperature to 300°. Beat the cream cheese until smooth. Add the egg, beating until well combined. Add the cilantro, lime juice, sour cream and avocado. Mix until smooth. Place approximately 2 tablespoons of cream cheese mixture into each muffin cup. Bake at 300° for 12-15 minutes (or until the centers are just set). Let cool completely and remove from pan. While the cheesecakes are cooling, make the tomato chutney. In a saucepan, combine the garlic, salt, vinegar, sugar, oil, cumin and jalapeño with the diced tomatoes and the reserved liquid. Simmer until reduced and thickened (20-30 minutes). Cool until room temperature.